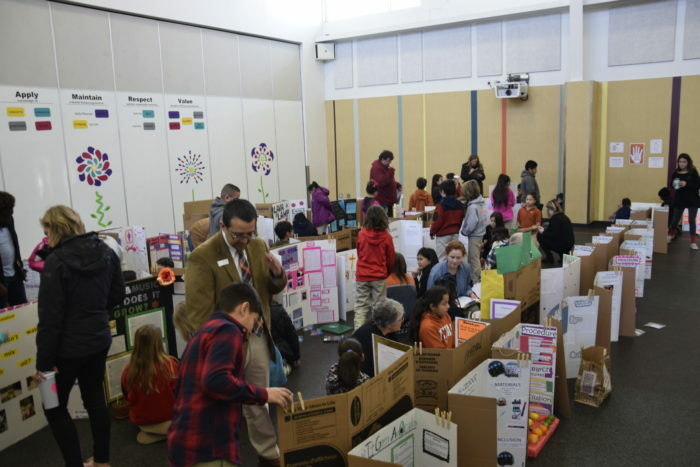 On Thursday, January 25, UT Elementary School held its annual science fair. Open to grades 3-5, projects ranged from testing physical forces and the limits of taste and smell to being right-side or left-side dominant and everything in between. 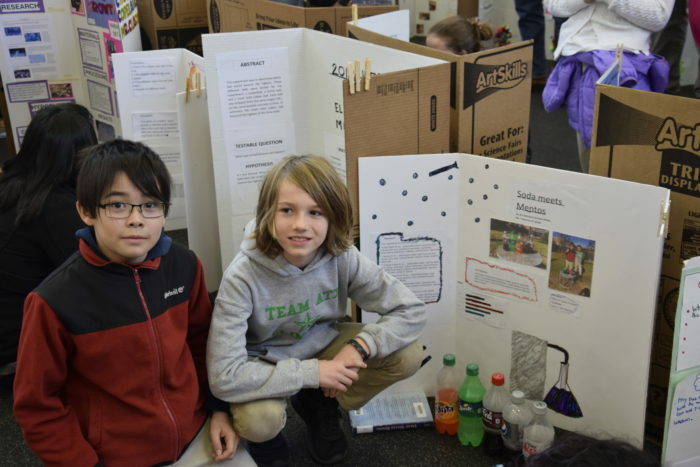 Make sure to check out the full gallery of science fair photos. 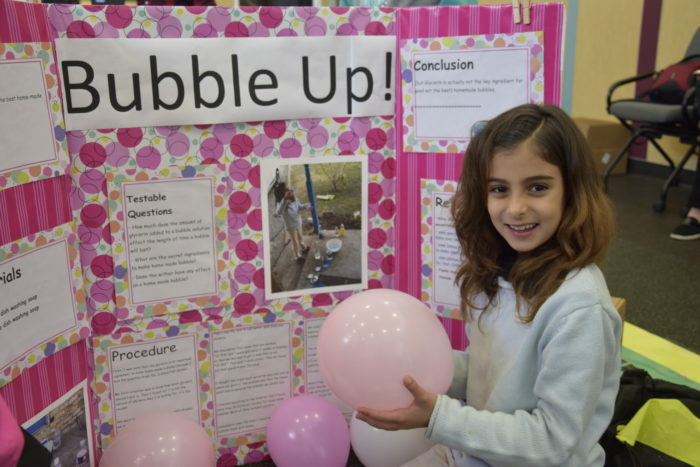 Below are highlights from three of the UTES Science Fair entrants. Test/Hypothesis: Determine which soda would cause the greatest reaction at the fastest speed when a mentos was dropped into it. “We dropped the mentos in there and then we kind of just ran away as fast as we could,” Kian said. The duo thought that Diet Coke would produce the greatest reaction (because Ari and Kian had done some research and found that Diet Coke had been used in a lot of similar tests). Results: They found that Diet Coke did in fact cause the greatest reaction of the sodas tested and in general the diet sodas had the greatest reaction (they also tested Diet Pepsi). Fun Fact: Ari noted that as part of their experiment they looked at all the ingredients in the sodas to see if anything stood out and found that there were tons of crazy ingredients. “That made us think that we shouldn’t drink soda anymore,” he said. Test/Hypothesis: To see if glycerin is the key to making bubbles. Her hypothesis was that dish soap would create the most bubbles. Results: Rachel found that the secret ingredient to making great bubbles was karo syrup. She tested traditional dish soap with water, Joy dishwashing soap and water, Joy dishwashing soap with ultra and water, and then a mix of water, karo syrup, and regular dish soap. The one that made the most bubbles was the solution that included the karo syrup. Fun Fact: Rachel said the way she determined that karo was the key was because all of the other solutions turned somewhat creamy which prevented bubbles. “But with the karo, we were able to blow a lot of bubbles,” she said. Test/Hypothesis: Does the amount of folds of a paper airplane affect the distance the paper airplane will travel. 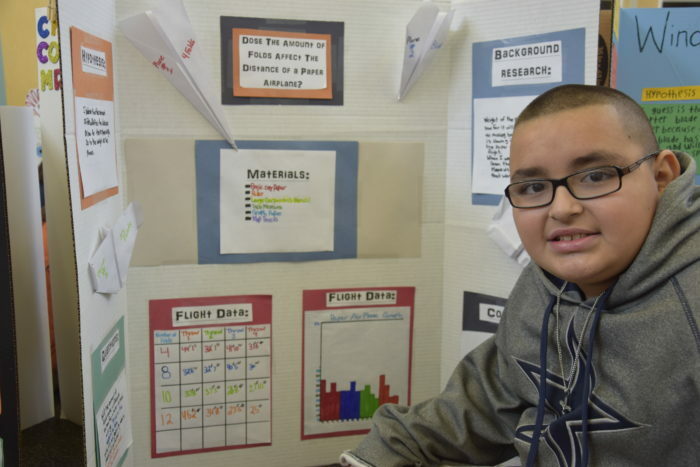 Joshua’s hypothesis was that more folds would equal greater paper airplane distance. Results: Joshua took each paper airplane and threw it four times and measured the distance of each and then took an average of the four throws. He found that the plane with the least amount of folds had the greatest average distance.